Context: The fifth edition of the Annual Survey of India’s City-Systems (ASICS) by Janaagraha Centre for Citizenship and Democracy has been released. The objective of the survey was to measure the preparedness of cities to deliver high quality infrastructure and services in the long term by evaluating “city systems”. The survey spans 23 Indian cities and factors in answers to 89 questions. The cities were scored based on the quality of laws, policies, institutions and institutional processes that together help govern them. ASICS groups questions into four categories: urban planning & design; urban capacities & resources; transparency, accountability & participation; and empowered & legitimate political representation. Pune, Kolkata and Thiruvananthapuram top the country in terms of urban governance. Delhi and Mumbai figure in the sixth and ninth positions respectively. Among the medium cities (with a population of up to one million), Ranchi has broken into the top 10 with a score of 4.1. Bengaluru and Chandigarh (perceived as a planned city) figured at the bottom of the list. On a scale of 10, the 23 cities – many of which are part of the government’s flagship smart cities mission – scored between 3 and 5.1 on four key components of governance. A majority of its cities “grossly underprepared” to deliver a high quality of life in the long term. And many surveyed cities are far behind cities such as London, New York and Johannesburg, which topped global benchmarks with 8.8, 8.8 and 7.6 points respectively. The cities assessed in the study are found to be generating only 39% of the funds they spend on an average, with Patna raising just 17% on its own. Only Mumbai, Delhi, Hyderabad and Pune generate over 50% of the amount they spend from their own revenue. The study found that in several cities, their own revenues did not even cover staff salaries. “Lack of adequate revenue sources of their own severely constrains the ability of our cities to invest in infrastructure and service delivery. The pace of reforms in India has been painfully slow. Recurring floods, garbage crises, air pollution, fire accidents, building collapses and dengue outbreaks are symptoms of this deeper governance crisis in our cities. The survey also found urban capacities across cities suffering from rampant staff vacancies, inadequate domain experience of senior municipal officers, and powerless mayors and councils. Commissioners were found to have only have 2.7 years of experience in urban management on an average. Average staff vacancy stood at 35%, with Guwahati bottoming out at 60%. The mayor and councils in our cities are toothless. They don’t have full decision-making authority over critical functions such as planning, housing, water, environment, fire and emergency services. No city in India has effective policies to deter plan violations, a deficiency that leads to the mushrooming of slums and unauthorised colonies. 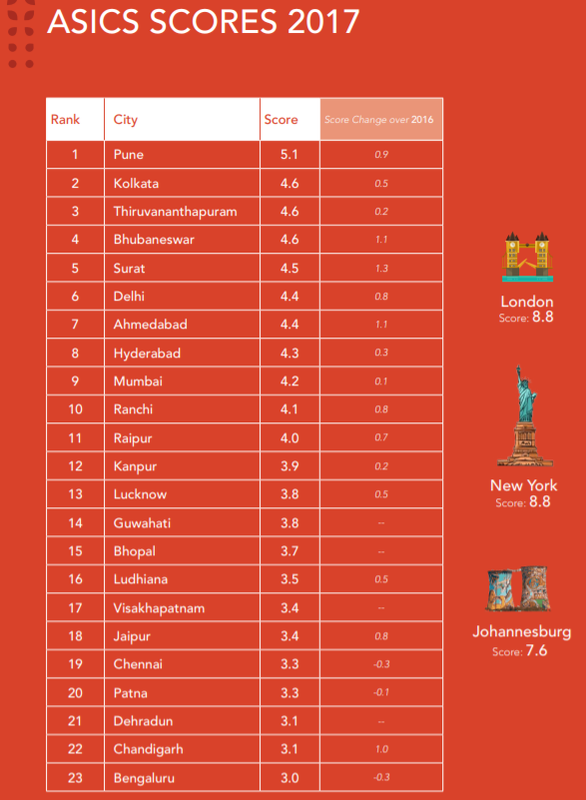 While all its 23 cities scored zero on this parameter, London, New York and Johannesburg notched a perfect 10 out of 10. Moreover, most of the country’s town and country planning acts date back to the previous century. It has one planner per four lakh citizens (as opposed to 48 in the United States and 148 in the United Kingdom). Lack of legislative imagination and political will has resulted in state governments not fixing city governance. The need now is to fix city governance on a war footing. There will be no change unless the state government empowers municipalities. For Prelims: ASICS Survey and performance of various cities. For Mains: Urbanization- challenges, issues and solutions, need for elected mayor, need for autonomy. AYUSH 82 An Anti Diabetic Ayurvedic Formulation. AYUSH SG An Anti-Rheumatoid Arthritis preparation. CCRAS is actively involved in scientific process of drug development adopting prevalent guidelines such as Good Clinical Practices Guidelines for ASU drugs (GCP-ASU), Ministry of AYUSH and National ethical guidelines for Bio-Medical Research (ICMR), WHO guidelines for traditional medicines etc. as per requirement and as feasible through its peripheral institutes. It is an apex body in India for the formulation, coordination, development and promotion of research on scientific lines in Ayurveda and Sowa-Rigpa system of medicine. Research activities of the Council include Medicinal Plant Research (Medico-Ethno Botanical Survey, Pharmacognosy and Tissue Culture), Drug Standardization, Pharmacological Research, Clinical Research, Literary Research & Documentation and Tribal Health Care Research Programme. For Mains: Significance of AYUSH. Context: The Union Cabinet has approved an Agreement for the Avoidance of Double Taxation and the Prevention of Fiscal Evasion with respect to taxes on income between India and Iran. The Agreement will stimulate flow of investment, technology and personnel from India to Iran & vice versa, and will prevent double taxation. The Agreement will provide for exchange of information between the two Contracting Parties as per latest international standards. It will thus improve transparency in tax matters and will help curb tax evasion and tax avoidance. The proposed Agreement also meets treaty related minimum standards under G-20 OECD Base Erosion & Profit Shifting (BEPS) Project, in which India participated on an equal footing. What is BEPS? BEPS refers to tax avoidance strategies that exploit gaps and mismatches in tax rules to artificially shift profits to low or no-tax locations. A DTAA is a tax treaty signed between two or more countries. Its key objective is that tax-payers in these countries can avoid being taxed twice for the same income. 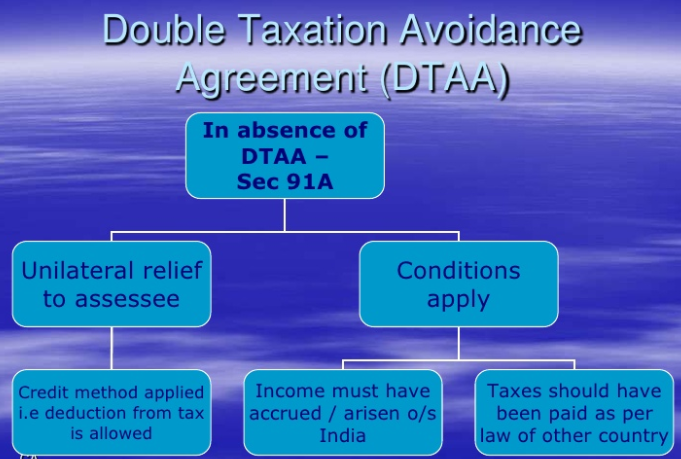 A DTAA applies in cases where a tax-payer resides in one country and earns income in another. India has DTAAs with more than eighty countries, of which comprehensive agreements include those with Australia, Canada, Germany, Mauritius, Singapore, UAE, the UK and US. For Prelims and Mains: BEPS, DTAA- need, challenges and implementation. Topic: Important aspects of governance, transparency and accountability, e-governance- applications, models, successes, limitations, and potential; citizens charters, transparency & accountability and institutional and other measures. What is it? 15 March is World Consumer Rights Day (WCRD), an annual occasion for celebration and solidarity within the international consumer movement. It marks the date in 1962 President John F Kennedy first outlined the definition of Consumer Rights. Significance of the day: It is an opportunity to promote the basic rights of all consumers, for demanding that those rights are respected and protected, and for protesting the market abuses and social injustices which undermine them. Theme: ‘Making digital marketplaces fairer’. WCRD was first observed on 15 March 1983, and has since become an important occasion for mobilising citizen action. Consumers International (CI), which was founded in 1960 organises WCRD. It is the only independent and authoritative global voice for consumers and has over 220 member organisations in 115 countries around the world. India adopted the Consumer Protection Act, later in 1986, thus providing a legal face to the Indian consumers. One of the strongest campaigns for addressal and protection of consumer rights in India, is “Jago Grahak Jago” which literally translates into, “wake up consumers”! This multimedia campaign from Ministry of Consumer Affairs, Government of India is aimed at creating an aware consumer. Context: The government has presented the Certificates of Appreciation to 34 Ministries/departments for implementation of e-office programme in their respective ministries/departments. The awards have been given by the Department of Administrative Reforms & Public Grievances (DARPG), Ministry of Personnel, Public Grievances and Pensions, Government of India. E-Office is one of the Mission Mode Projects under Digital India Programme. The e-Office solution enables core operations of the Government at all levels to be performed in a virtual ‘paper-less’ environment. This application is, thus, a major step in realizing the objective of an open and responsive Government. The Department of Administrative Reforms and Public Grievances (DAR&PG) is the nodal Department for implementation of e-Office project. National Informatics Centre (NIC) is the technical partner in this project. To improve efficiency, consistency and effectiveness of government responses. To reduce turnaround time and to meet the demands of the citizens charter. To provide for effective resource management to improve the quality of administration. To establish transparency and accountability. Context: The India-based Neutrino Observatory (INO) project has got a fresh lease of life with the Ministry of Environment and Forests (MoEF) taking it up as a special case and granting it environmental clearance to set up the lab in Bodi West hills. While granting EC, the committee stipulated specific conditions, of which two are key for the project to take off. One is the consent to establish and operate to be obtained from the Tamil Nadu Pollution Control Board (TNPCB). Also, the INO team has to obtain the necessary forest and National Board for Wild Life clearances as per law. The Mathikettan Shola National Park in Idukki district, Kerala, is situated within five km from the project site. 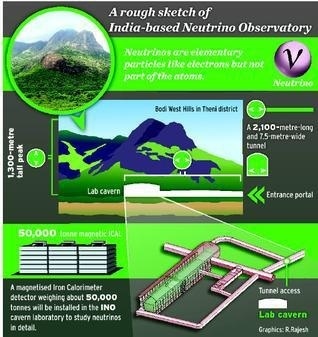 The India-based Neutrino Observatory (INO) Project is a multi-institutional effort aimed at building a world-class underground laboratory with a rock cover of approx.1200 m for non-accelerator based high energy and nuclear physics research in India. The initial goal of INO is to study neutrinos. It is a mega-science project under the XII five-year plan of Government of India with an investment of about 1350 crores, jointly funded by the Department of Atomic Energy (DAE) and the Department of Science and Technology (DST). Construction of an underground laboratory and associated surface facilities at Pottipuram in Bodi West hills of Theni District of Tamil Nadu. Construction of an Iron Calorimeter (ICAL) detector for studying neutrinos. Setting up of National Centre for High Energy Physics at Madurai, for the operation and maintenance of the underground laboratory, human resource development and detector R&D along with its applications. Neutrinos, first proposed by Swiss scientist Wolfgang Pauli in 1930, are the second most widely occurring particle in the universe, only second to photons, the particle which makes up light. In fact, neutrinos are so abundant among us that every second, there are more than 100 trillion of them passing right through each of us — we never even notice them. Neutrinos occur in three different types, or flavours. These are separated in terms of different masses. From experiments so far, we know that neutrinos have a tiny mass, but the ordering of the neutrino mass states is not known and is one of the key questions that remain unanswered till today. This is a major challenge INO will set to resolve, thus completing our picture of the neutrino. Neutrinos are by far the most numerous of all the particles in the universe (other than photons of light) and so even a tiny mass for the neutrinos can enable them to have an effect on the evolution of the Universe through their gravitational effects. There are other recent astrophysical measurements that provide information on the evolution of the Universe and it is crucial to seek complementary information by direct determinations of the masses of neutrinos and their other properties. In a sense, neutrinos hold the key to several important and fundamental questions on the origin of the Universe and the energy production in stars. We have some partial answers but many details are still awaited from future experiments. Yet another important possible application of neutrinos is in the area of neutrino tomograph of the earth, that is detailed investigation of the structure of the Earth from core on wards. This is possible with neutrinos since they are the only particles which can probe the deep interiors of the Earth. Why should the laboratory be situated underground? Neutrinos are notoriously difficult to detect in a laboratory because of their extremely weak interaction with matter. The background from cosmic rays (which interact much more readily than neutrinos) and natural radioactivity will make it almost impossible to detect them on the surface of the Earth. This is the reason most neutrino observatories are located deep inside the Earth’s surface. The overburden provided by the Earth matter is transparent to neutrinos whereas most background from cosmic rays is substantially reduced depending on the depth at which the detector is located. What are the benefits to local people from this project? The construction contract will specify that local labour should be used, based on the skill levels, to the maximum extent possible. Furthermore, gainful employment will be there for a small number of people by way of sourcing of services and daily needs for the INO facility and for the upkeep of buildings and landscapes. A major benefit will be for schools and colleges in the region as the students interested in science can benefit from the outreach activities as well as doing projects at the lab.